This orange cake is great birthday cake or beautiful and tasty table decoration. 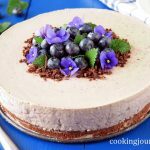 Chocolate sponge with crunchy pavlova, the most delicious orange jam you can imagine, and white cream frosting with a hint of rum. This combination may sound sophisticated, but you will be surprised with the bursts of different flavors in your mouth that perfectly come together! The cake is decorated in rustic style. If you follow the recipe, you will have no difficulties with this chocolate orange cake. 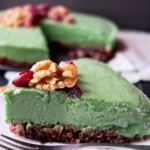 It takes time, but delivers emotions and flavor celebration! To my mind, the main part of this cake is orange cream. You can prepare the cream ahead of time and store it covered in the fridge up to 3-4 days before you need it. 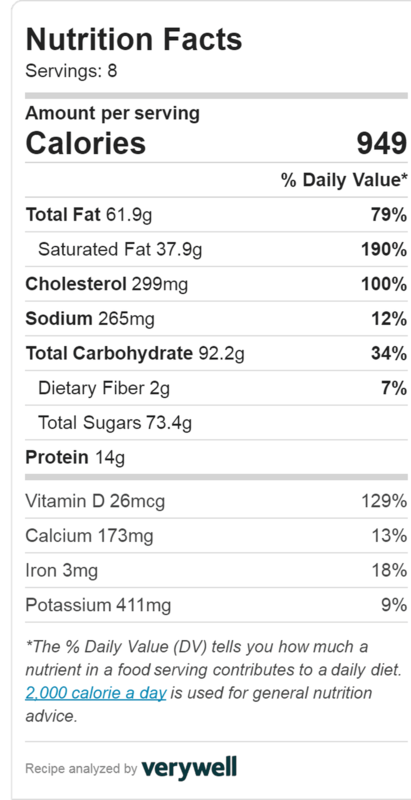 It is made with natural orange juice, I don’t recommend to substitute it to the store bought juice, as it may change the flavor. You need to cook this sauce on a double boiler for about an hour or more, until it thickens, then cool it. I also added orange food coloring to boost the color, but it is totally optional! If you are satisfied with the color of your orange sauce, you can omit this step. You can get the orange color by mixing red and yellow food coloring, too. 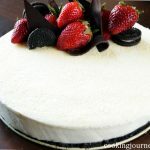 Chocolate sponges are thin and moist with crunchy pavlova on top, soft inside. 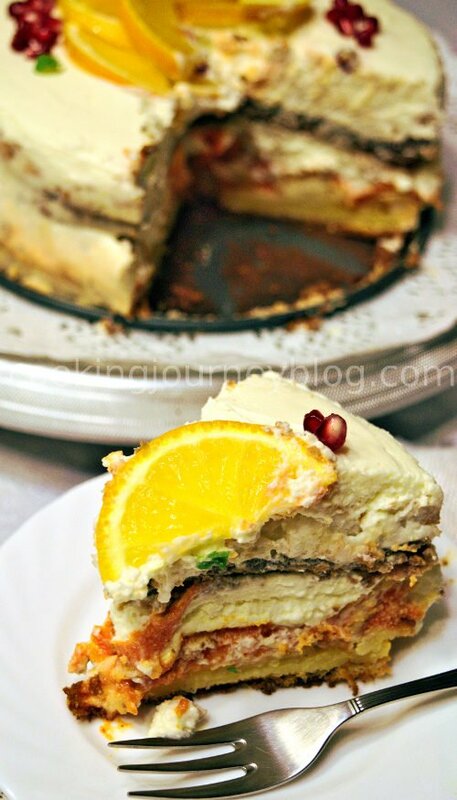 I think that pavlova layer adds interesting and surprising texture to this orange cake. Don’t be afraid to cook it at the same time with chocolate sponges. Pavlova layer will brown and crack, but we will cover it with orange cream and white frosting. These cracks will absorb all the delicious creamy flavor. It will become more soft next day, but will leave a lot of crunchy elements, when you bite it. 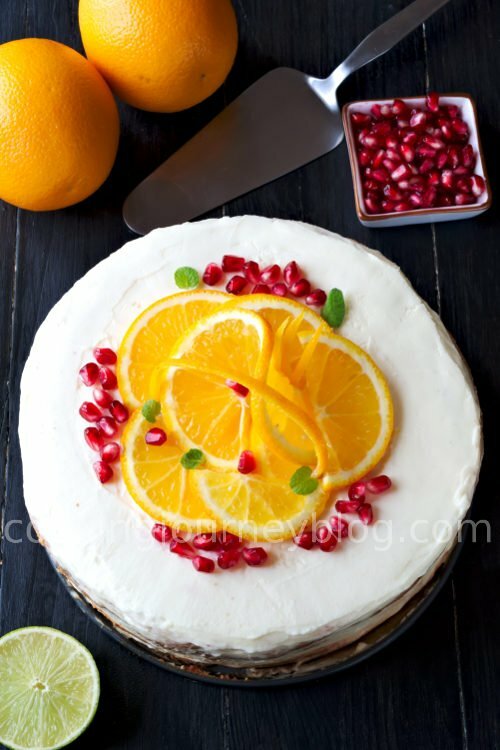 I decorated this birthday cake with orange slices, mint leaves and pomegranate seeds. I decided that it would be great looking rustic cake, so I didn’t put much frosting. 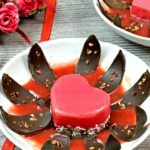 You can oversee chocolate sponges and a little bit of orange cream, when look on the cake. To my mind, rustic cake looks more appetizingly than the one covered with a lot of fondant. 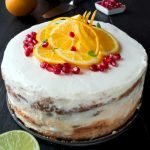 The pomegranate seeds are optional, but a little bit of red color, to my mind, suits this orange cake with white frosting. This orange cake tastes amazing from the bottom till top, believe me. Chocolate, orange, cream, rum and a crunch of pavlova…mmm. By the way, you can set a challenge your guests – to guess the ingredients! The one who recounts more, will receive another slice of cake! Why not? I recommend to plan this cake about 1-2 days before celebration. The first day you can prepare and cool orange cream and chocolate sponges with pavlova. Later, or next day assemble the cake, trim the edges, if need and cover with white cream frosting. Leave the orange cake in the fridge overnight. Next day decorate it and serve! 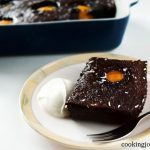 This chocolate orange cake is worth the time you spent making this recipe! Orange cake is great birthday cake or beautiful and tasty table decoration. Chocolate sponge with crunchy pavlova, the most delicious orange jam you can imagine, and white cream frosting with a hint of rum. Beautiful rustic cake. Whip egg with 2 yolks until stiff peaks. Add butter and fresh orange and lime juice. Combine together. Cook on the double boiler on low temperature for 1-1,5 hours until thick. Stir occasionally. Add coloring in the end, if needed. While your orange cream is cooking, prepare the chocolate sponge. Preheat the oven to 180 C / 355 F. Prepare two 22 cm spring form pans, smear with butter or layer the bottom with baking paper. Whip egg yolks with 1/3 sugar until pale fluffy mixture. Slowly add soft butter, continue whipping the mixture until combined. Slowly add orange juice and yogurt, combine together. You will get thick creamy mixture. Whip egg whites in a separate clean bowl, then add 2/3 sugar (all the rest) an continue whipping until white and doubled. Add 1 tbsp yogurt and whip together few minutes more. Distribute the egg white mixture to 2 spring form pans. Smooth the top. Remove from oven and let the chocolate sponge cool for about 15-20 minutes, then remove from pan. Make sure you have same size sponges. Put cooled sponges with pavlova on top of the other and trim the edges if needed. Whip heavy cream with icing sugar and cream cheese until stiff peaks. Put the first biscuit and smear it with orange cream then white cream and put the second biscuit on top. Smear the the top biscuit and edges with white cream. Let it cool in the fridge for about 2-3 hours or overnight. 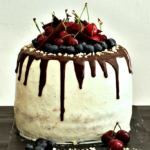 Now this is definitely a celebration cake — especially with that pavlova layer — holy cow! This is worthy of inviting guests over, but I think I’d want to eat it all myself. LOL! Haha, you can also treat yourself every day with a piece of orange cake! Why not? We live only once 🙂 Oh and you should reserve some orange cream to enjoy, when no one sees! Wow this orange cake looks so beautiful. This cake is sure to impress any guest! Thank you! The taste Orange cake will also impress! 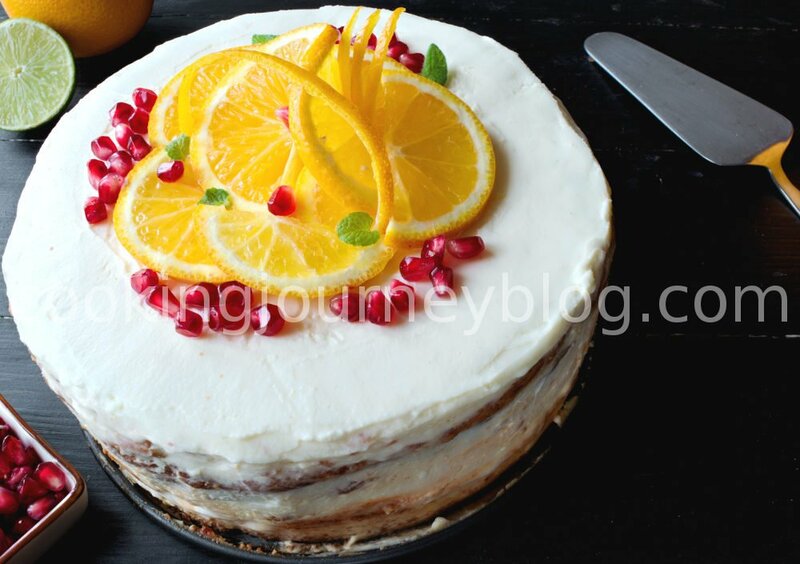 This cake is great for enjoying, when orange fruits are in season. Truly sunshine, thank you! I love the orange juice in the pav and both orange and lime in the cream! Such a fun flavor combination for a beautiful cake! Yes, so many things, but comes out so delicious in every bite of the cake! Oh, my word! This cake looks phenomenal! I can’t wait to give this a try! This orange cake is great for winter season!